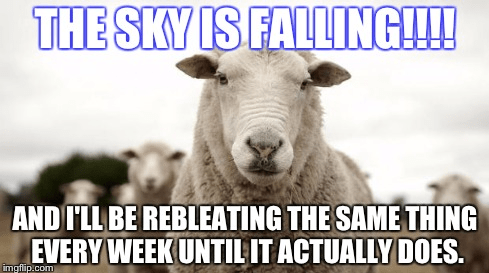 Thursday Rant: The financial media sheep rebleat, rebleat, rebleat. I have no time lately, so I wasn’t going to post today. My full time job is keeping me very busy. So is the bathroom remodel. And wow, Mrs. 1500 just started a sweet gig*. Life is good, really good. Just hectic. However, I read something on Wednesday morning that I had to post. First, I need to explain some of my thoughts. The financial mainstream market media goes bleat, bleat, bleat. This cheap “news” from the not-so-deep sheep should be relegated to the garbage heap. These headlines are meant to scare you so that you click on them. That is all. It doesn’t matter to the long term investor and unless you’re really old, you should be in it for the long game. Even a drop of 25% won’t mean much when you look in the rearview mirror 20 years from now. Besides, timing markets is an overwhelming recipe for disaster. The markets will drop. It is the cycle of things. It may happen tomorrow or in 2 years or even 5. No one knows when. It may be caused by the US Fed raising rates or a terrorist attack or a computer glitch over at the NASDAQ. No one knows how or why. When the markets fart, don’t freak out. Just continue buying the same things you’ve been buying all along, just at a temporary discount. After the downturn, there will be more bull runs where the markets will see greater highs. There is always a dawn after the dark. Never forget it. Anyway, all of this is just a long winded introduction to this highly entertaining article. UPDATE: Reader Seth passed this equally great article along from Morgan Housel, one of my favorite finance writers. Oh, and a big congratulations is in order for the Frugalwoods. I’m thrilled for them because Babywoods is on the way. I’m also thrilled for myself because Babywoods is a girl and we have no shortage of stuff to pass on. Hello closet space! *Somehow, Mrs. 1500 found a way to live my dream. Some day, I may explain it all. Long, long story. Congrats to the Mrs.! I just looked outside, I didn’t see anything falling from the sky. That being said, I make sure to stay up to date on financial news about the companies in my stock portfolio. But I mean hard news specific to the companies. Other than that, I don’t even click on the links for opinion pieces or for analyst ratings on the companies. It’s best to tune out the blather. What’s the new gig Mrs. 1500? Hey Sam, I’ll PM you. Why you be so sneaky bout it? There are no anonymous bloggers. Blog long enough and you’ll inadvertently reveal enough info about yourself for any curious person to put it all together. Morgan Housel had an awesome article recently that tracks along these lines. Thanks for passing this along! Awesome! I love how it goes all the way back to 2009. Part of an email I received today from Vanguard. The last sentence says it all. Regardless of when the Fed begins to raise short-term rates, we believe it will be important to watch the pace of rate increases in the years ahead and the “terminal rate” at which the increases stop. Our view is that the Fed is unlikely to raise rates as high as they have in the past, and when it does raise rates, it will be at a very gradual pace. We may see volatility in the bond and stock markets in the months ahead as investors keep a close watch on changes in Fed policy. Long-term investors would be wise to avoid making hasty changes to their asset allocations in reaction to sudden shifts in the markets—shifts that can reverse as quickly as they occur. Vanguard, could I love you any more than I already do? The answer is “yes” after reading zut’s comment. Remember, you can win any argument about the stock market if you pick the right time period, and every prediction will come true eventually. Sadly, I’ve seen personal finance bloggers do the same thing. They lead with the correct statement that “nobody can time the market” followed by “that being said, I’m liquidating my portfolio due to the market being so high” and justify it with the again correct principle that you buy when the market is down. Except you don’t know! It’s day trader mentality and it’s poison. So since I’m not getting any responses via other avenues I have tried, I’ll air them here. Got the package in the mail, you guys are awesome, I have not started on the door, but I did start on the other part of the package. OK I think that’s it. Even Steven recently posted…No Really I Got This: Does Income Matter When The Bill Comes? how did mrs 1500 figure out how to be a beer tester? I know you live in an area with many breweries, but I figure those are coveted jobs! LOL!!!! Comment of the day Jeff. Thank you so much!!!! Greatly appreciate the good wishes :). And, we will be thrilled to take you up on your offer of baby hand-me-downs!! Babywoods is excited. P.S. Huge congrats again to Mrs. 1500!! Very cool that Mrs. 1500 has a new gig and is living your dream. Congrats. There’s always someone screaming that sky is falling… it’s just a matter whether you listen to them or not. Congrats on the new job! I still have a good 15+ years in the market until I’m even able to think about retirement most likely, so I just keep putting my money in for now. Besides – the contributions outweigh any loss/gains at this point still, haha. But I guess we all have to start somewhere. Debt Hater recently posted…Buying a Used Car: Dealer or Private Party? We don’t even read much financial news, mostly because we know it wouldn’t change our strategy (mostly index funds and bond funds), and because we know the odds on trying to time the market. BUT, when you see your portfolio keep growing in a way that seems irrational and out of step with the broader economy, it’s hard not to get sheepish (sorry — couldn’t resist). We’re continuing to sock money into our investments every month, but that market anxiety is real. The market will crash again in a major way. After that though, it will go up again. Best to prepare mentally for it now so you don’t freak out when it happens. What is the worst that can happen? Working until 45 instead of 43 or 44 isn’t much of a hardship. Send me a PM when the WSJ splashes a front page titled “The Death of Equities” and we can get giddy like 2 little schoolgirls about to see The Backstreet Boys (circa 1990s). I was just trying to explain this to someone the other week. “I don’t want to invest now… the market is at ALL TIME HIGHS!!! !” I try to explain why I don’t care and invest anyways, but I guess putting your money where your mouth is doesn’t always work. Today, I have seen no falling sky, just a blue sky while out on a family reunion. What more do you want? I guess it comes down to being prepared up front, to trust your asset allocation and to make sure you have an emergency fund. I’m 100% in agreement with you; despite the fact I’ve only been investing for the past 2 – 3 months I can already see how people are acting like scared sheep in relation to a recession; and most obviously in concerns with the Rising Fed Rates. It’s all just noise, and the true intelligent investor will just stay in the market throughout. I agree with the spirit of this article. You should continue to dollar-cost average regardless of where the market it. My one point of disagreement is if you come across a large sum of money today. With the current multiples of US public equities, I would be wary putting a large sum into it right now. Instead, I would think deeply about diversifying into other asset class/foreign markets and also dollar-cost averaging that lump sum. So I agree overall, but I think valuations are still important, even if you have a longer time frame. Even Warren Buffet increases his cash allocation as we get further and further from the previous recession. I could be wrong on the numbers, but I believe I read that he typically likes to have 20% in cash 3-5 years out of a recession, and then increase it 5-10% every year after. Seems like a wise plan. I am going to do the same. It would be nice to have a little powder keg of money in the bank, ready to pounce on some good deals Buffett/Munger style! The sky will fall. Eventually. But we might all live wonderfully long, successful, happy lives before it does. Don’t be surprised when it does happen (so plan for it), but don’t live in fear every day. Congrats to Mrs. 1500 on the new awesome job! A 3 month paid sabbatical! Wow! Fingers crossed that she takes the plunge! Congrats to Mrs. 1500! I definitely feel like people are unable to put aside emotion when it comes to investing. That seems to be the biggest reason so many people fail at investing – they lack the long-term view you need to have. Then they blame it on the markets instead of their own rash decisions. Yes! My friends always try to stump me, asking me whether it’s a bull or bear market and why I insist on investing even when I don’t know. The truth is – I don’t know and I don’t care what kind of market it is! It’s going to go up and down no matter if I know or not, so I’m just going to do the one thing I can control – my own consistency.